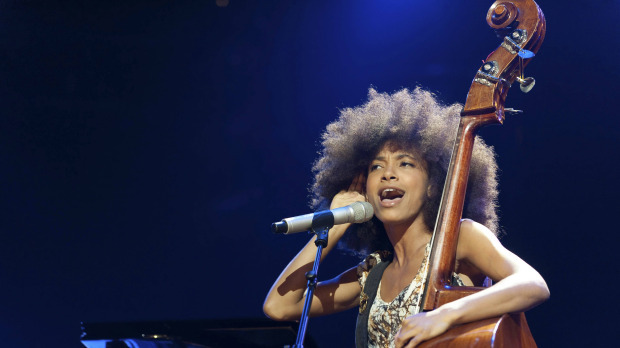 *Due to popular demand, Bowery Presents has added a second Esperanza Spalding show at the Apollo Theater, set for October 27,2012 at 8pm. Both performances will feature the bassist, vocalist and composer on the Apollo stage performing songs from her latest album, Radio Music Society. This concert will mark Spalding’s debut at the legendary Theater and is a part of her world tour. Spalding’s prodigious talents as a bassist and singer paved the way for her to become the first jazz musician to win the Grammy Award for best new artist, in 2011. Her latest release, Radio Music Society, is a companion release, rather than a sequel, to the internationally acclaimed Chamber Music Society, the basis of her Best New Artist GRAMMY® Award in 2011. Radio Music Society is her most diverse, ambitious and masterful recital yet. Each of the 12 songs on the recording is accompanied by conceptual music videos, which further express Spalding’s inspiration and story behind each track. Tickets to both performances are $40 and $64 and are available at www.apollotheater.org; in person at the Apollo Theater Box Office, 125th Street between 7th and 8th Avenues; over the phone at 212/531-5305 or (800) 745-3000; and on www.ticketmaster.com. Tickets for the October 26th show are already on sale. Bassist, vocalist, and composer Esperanza Spalding unveils the brilliant compositions of her new release, Radio Music Society into a dynamic “big band” format. Inspired by her desire to write for a large ensembles, Spalding has crafted her performances to spotlight the talents of her 12‐piece world class band including Spalding on electric bass, double bass and lead vocals; Leo Genovese, piano, Rhodes and keyboards; Chris Turner, backing vocals; Tia Fuller, alto saxophone, backing vocals and music director; Lyndon Rochelle, drums and backing vocals; Jef Lee Johnson, electric guitar and backing vocals; Jeff Galindo, trombone; Corey King, trombone; Igmar Thomas, trumpet; Leala Cyr, trumpet and backing vocals; Dan Blake, tenor and soprano saxophones; and Aaron Burnett, tenor saxophone. Weaving high‐caliber artists into the context of a big band could be a challenge, but not for Spalding. Her ability to combine musical styles makes her writing accessible to audiences across the spectrum. The Apollo is a national treasure that has had significant impact on the development of American culture and its popularity around the world. Since introducing the first Amateur Night contests in 1934, the Apollo Theater has played a major role in cultivating artists and in the emergence of innovative musical genres including jazz, swing, bebop, R&B, gospel, blues, soul, and hip-hop. Ella Fitzgerald, Sarah Vaughan, Billie Holiday, Sammy Davis, Jr., James Brown, Michael Jackson, Bill Cosby, Gladys Knight, Luther Vandross, D’Angelo, Lauryn Hill, and countless others began their road to stardom on the Apollo’s stage. The Apollo Theater’s new artistic vision builds on this legacy. With music as its core, the Apollo’s new programming focuses on large scale and more intimate music, dance and theater presentations. The Apollo will continue to present historically relevant presentations, as well as more forward-looking, contemporary work. Based on its cultural significance and architecture, the Apollo Theater received state and city landmark designation in 1983 and is listed on the National Register of Historic Places.